This album is a collection of songs by the famous Egyptian singers Farid al-Atrache and Abdel Halim Hafez, performed by the producer's own band. An alternate title for this review could have been "When Bad Things Happen To Good Music". I hated this album. 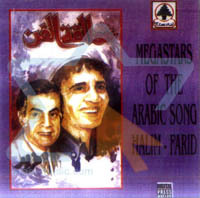 When I bought Megastars Of The Arabic Song, I did so on the strength that I generally like music composed and performed by Farid Al-Atrache, and this CD claimed to feature 14 of his songs. There were also 15 songs by Abdel Halim Hafez included -- another Egyptian singer whose music I enjoy very much. I wasn't familiar with all of the songs listed on the CD, but I liked the songs whose titles I did recognize and I welcomed the opportunity to become familiar with additional songs by those composers. Singers I like? Several song titles I like? It seemed like a safe bet. Wrong. It was bland, monotonous, and boring. This is Egyptian elevator music. I've never liked American elevator music, and the music on Megastars was just as banal, bland, and mediocre as the American stuff I've heard. The format of this album was that of two medleys. One medley incorporated the Farid Al-Atrache songs, and the other incorporated the Abdel Halim Hafez songs. The arrangement of each medley is a continuous stream of female choral vocals, with almost no variation in rhythm, tempo, or instrumental arrangement for almost 15 minutes straight. For a 15-minute show, there's not enough stylistic variation of fast music, slow music, shifting rhythms, instrumental vs. vocal, and drum breaks to provide variety. Although occasionally there is a brief drum interlude between songs, these tend to be solely for the purpose of maintaining the rhythm until the next song starts, without trying to be interesting. An audience watching someone perform to this music would get easily bored. It would be difficult to extract a shorter clip from the medley to assemble together with other songs into a performance because the medley really is continuous. There are very few good breaks that lend themselves well to cutting. Upon realizing that I dislike the style so intensely that I would never use it for either dance practice or performance, I then considered whether this collection might be a suitable tool for a newcomer to Middle Eastern music to learn more about the songs made popular by legendary Egyptian singers. So I decided to evaluate this music from that angle, and I found it wasn't suitable for that, either. One problem is that this entire CD is broken into only 2 tracks: one track of Abdel Halim Hafez's music, and the other of Farid Al-Atrache. I assume the original was probably released on cassette tape, and then each side of the tape was copied in its entirety into a single CD track. Each track is a medley of 14-15 songs that run from one directly into another. There is no apparent break at all from one song to the next. So, when a song I was unfamiliar with transitioned into another that I didn't know either, I had great difficulty figuring out whether the next song had started yet. Except for when a song I knew came on, I usually wasn't sure just which song I was listening to at any given moment. Even when I could identify which song was starting, each song clip was so short (a minute or less each) that it didn't provide much insight into what the song as a whole might sound like. I suppose this could be used as background music at a restaurant, doctor's waiting room, or similar venue, but I honestly wouldn't consider using it even for that. Nothing further to add beyond the description above. I am very puzzled that the song "Hibbina" (which was composed and made famous by Farid al-Atrache) would appear in a medley of songs that supposedly were associated with Abdel Halim Hafez. You like the style of arrangement used for elevator music and doctor's waiting rooms. You're so passionate about the music of Abdel Halim Hafez and/or Farid Al-Atrache that you enjoy even a bad arrangement of it. You want something that's convenient to use as background music for telephone on-hold music, a restaurant, or similar environment. You're not a fan of 20th-century Egyptian music. You love Egyptian classical music, but want to hear it played using classical instrumentation. You dislike the type of vocal style used for elevator music. You prefer to have your favorite songs be more than a minute long when you listen to them. You're looking for dynamic music to use for performance. I wish there would have been track separators between the songs, making it easy for me to go directly to a particular song if I want to. The choice of vocal style is bland, banal, and boring. Individual songs are very, very short--usually less than a minute each. The lack of variation in vocal style, song rhythm, tempo, and instrumentation makes this album very monotonous. The song "Hibbina" is included in the medley for Abdel Halim Hafez, which is peculiar because the singer who made it famous was Farid al-Atrache. Usually, when an album contains some songs I especially enjoy, I can find something good to say about it even if I don't like the overall musical style. Unfortunately, this album is an exception - even the songs I typically enjoy grate on me with their boring arrangements. I wouldn't even use this as elevator music. None. I've never had any contact with the musicians featured on this album, or with the producer.